This Georgian Flatbread can be served as a side dish or as a vegetarian main dish with a side salad. 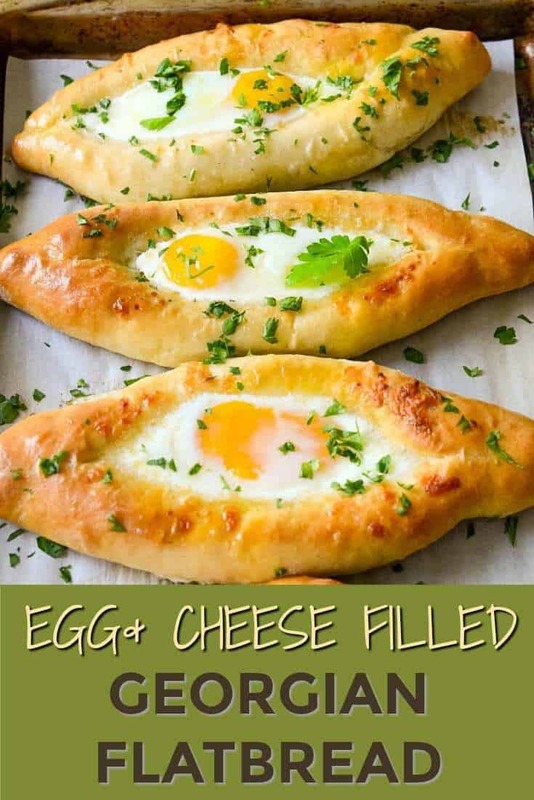 Filled with a combination of creamy and delicious cheeses and topped with an egg, these perfectly baked Khachapuri are sure to please your family and friends. Just like Mexican cuisine has gained huge popularity in the US, Georgian food takes its own important role in a shaping of taste preferences of people from many Post-Soviet countries. In Ukraine, a lot of popularity earned so called street vendors or street hawkers. You can find them in any city usually selling food from their booth or on regional trains. Since many people can’t afford going to a restaurant and trying authentic Georgian recipes there, they love buying food from local vendors. Khachapuri or Georgian Flatbread is a very affordable Georgian recipe that you can often buy from street vendors. It’s a kind of food that everyone loves. So what exactly is Khachapuri? 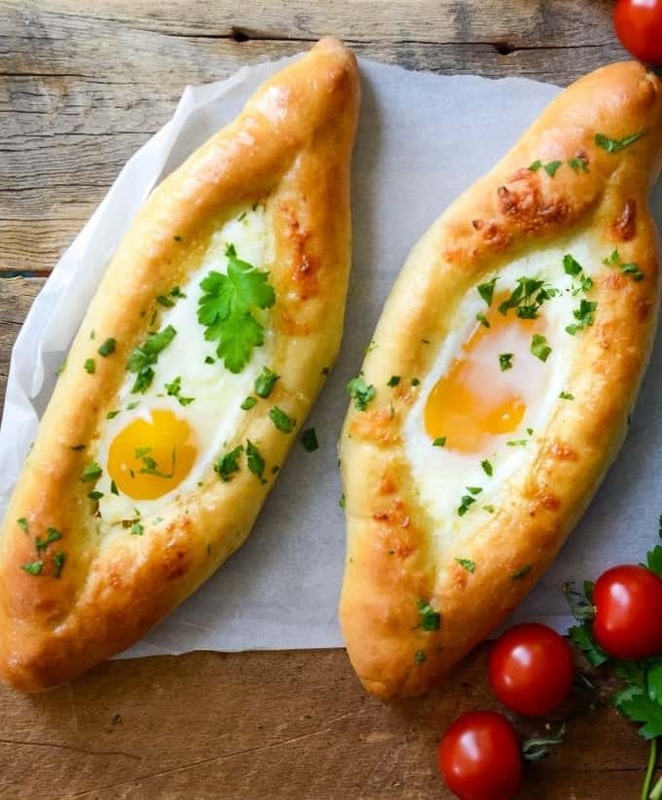 It’s a traditional Georgian yeast flatbread filled with cheese and topped with egg. For this recipe most commonly used cheese is Sulguni, which is very tangy and moderately sour. It tastes amazing. If you live in the area with Georgian/Russian or Ukrainian grocery stores, you can probably find it there. In Indiana where I live, these stores are quite rare and for my recipe I used a mix of Mozzarella and Feta cheese, that worked just as fine. You can also use Halloumi cheese in place of Feta. Khachapuri has many types. 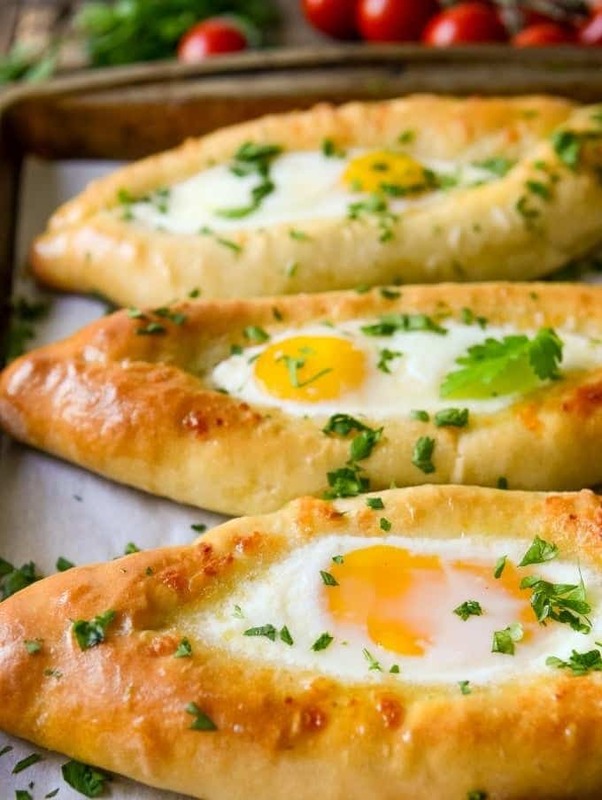 Today I’m going to show how to make Adjarian Khachapuri, named after Georgian region. They are formed in a boat shape and topped with cheese and egg. Khachapuri are super delicious. They are best eaten right away while cheese is still nice and melty. In a small bowl, dissolve yeast with 3 tablespoons and 1 teaspoon of warm water, sugar and let it sit for 15-20 minutes until bubbly. In a bowl of Kitchen Aid add 1 cup of water, milk and mix with a whisk attachment. In the same bowl, add 4½ cups of flour, salt, yeast mixture and egg and mix the dough on the 1st speed until well combined. Cover the bowl with a plastic wrap and let it sit for 20 minutes. Turn on a second speed and mix the dough until it no longer sticks to the walls of the bowl. Lightly brush a bowl with a vegetable oil and place the dough to rise for 1.5 - 2 hours. After the dough has increased in size, remove it from the bowl, lightly oil your hands and on the lightly floured surface knead the dough a few times. Put the dough back into the bowl and leave it in a warm place until triples in size (about 1 - 1.30 hours). After the dough has tripled in size, divide it into 6 even pieces. Cover with a towel and leave it on a lightly floured working surface while you prepare the filling. In a medium bowl combine Mozzarella, Feta and water. Mix well. Roll 2 opposite sides of Khachapuri towards the center and tightly pinch the corners. Add more cheese mixture in the center of Khachapuri so that it was fully stuffed with cheese. Transfer Khachapuri onto a parchment lined baking dish. Continue the process with the remaining pieces of the dough. Bake in a preheated oven for 15-20 minutes until edges became golden brown. 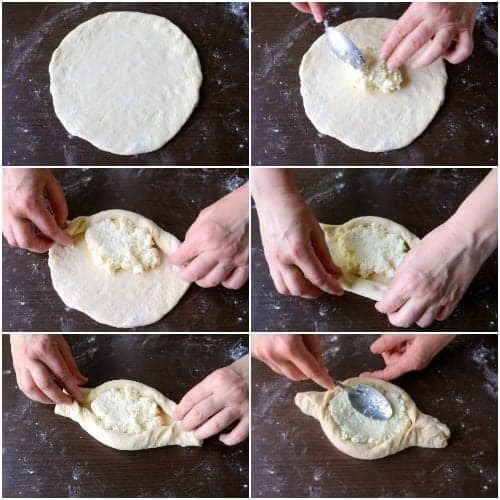 Remove Khachapuri from the oven and with a back of a spoon make an indentation in a center of each flatbread. Carefully beat the egg and drop it into a well. Continue baking for another 5 minutes until egg white is no longer translucent but yolk is still runny. Remove from the oven, lightly brush the edges of Khachapuri with melted butter and sprinkle with chopped parsley. In my step-by-step photos, I added cheese only in the center of Khachapuri. While it was delicious, we felt that the more cheese the merrier. Therefore, in the instructions I recommend you spreading a cheese mixture all over Khachapuri, not just in the center. Be sure, once you try Khachapuri, you’ll be tempted to make it again. Hello. I’m in the process of making this recipe as I’m typing and I’m a little bit confused with the flour count. The ingredients say 51-4 and then the directions say 4 1-2 which one is it ? Hi Peggy! 5 1/4 cups that’s the overall amount of flour you might need. You will see it during the process how much flour is necessary. At first you add just 4 1/2 cups of flour. If the dough comes too sticky and doesn’t come together, you add a little bit more. The final result should be the dough that is elastic and doesn’t stick to your hands. Sorry for the late reply! I hope the dough came out well. how far in advance can I prep these? having a shindig Saturday night and I won’t be able to prepare Everything until 5:15pm that day. So how can I prep this for success? Can I keep these kachapuri filled and shaped in the fridge but bake it off Saturday night? I’ve never made this recipe in advance, but I can give you a few recommendations/options on what I think would work best. If you can, I would recommend you to make the dough in the morning or even the night before, divide it into 6 even pieces, wrap in a plastic wrap and place in a fridge overnight or until you’re ready to fill it. You can also grate the cheeses in advance and store in a fridge so that by the time you have to assemble and bake Khachapuri everything was ready. If you don’t have much time on Saturday evening to assemble everything, you can also try to prepare the dough and bake Khachapuri completely up until step 9 (adding the egg) in the morning or the night before. Store cooked Khachapuri in the fridge in the airtight container and when your guests arrive, just crack the egg and bake for 5-10 more minutes until the egg sets. The option to fill Khachapuri and then bake in the evening might work too, but my concern is that the cheese-filled dough may taste a bit sour at the end. I’m not 100% confident about that, but that’s a possibility. If you go that route, there a few things to keep in mind. When you fill Khachapuri, store them in the airtight container on the upper level of your fridge (where it’s the coldest). If you have a large plastic container with a lid, you can use that. Don’t forget to cover the bottom of it with a parchment paper. Or you can place everything on the baking sheet (lined with a parchment) and tightly wrap the baking sheet along with Khachapuri with a plastic wrap, making sure the air is not coming inside. (otherwise the dough may dry out). Than, unwrap, let filled Khachapuri stand on the counter for 30 minutes to come to a room temperature and bake. I hope my recommendations will help. Good luck! When it comes to eating Georgian food, there’s no calorie count, ha-ha! Thanks for your comment Ashley! Look fabulous and want to try while family is here this weekend.never heard of this delicious bread. Two comments on instructions. No info on when to add yeast mixture or when sugar goes in. I’d just add those to mixing bowl, but clarifying would be helpful for a novice baker. Eileen, thank you for letting me know about the gaps in the instructions. I’ve just updated the recipe. Please let me know if you have more questions. I live in India and have had Khachapuri here. 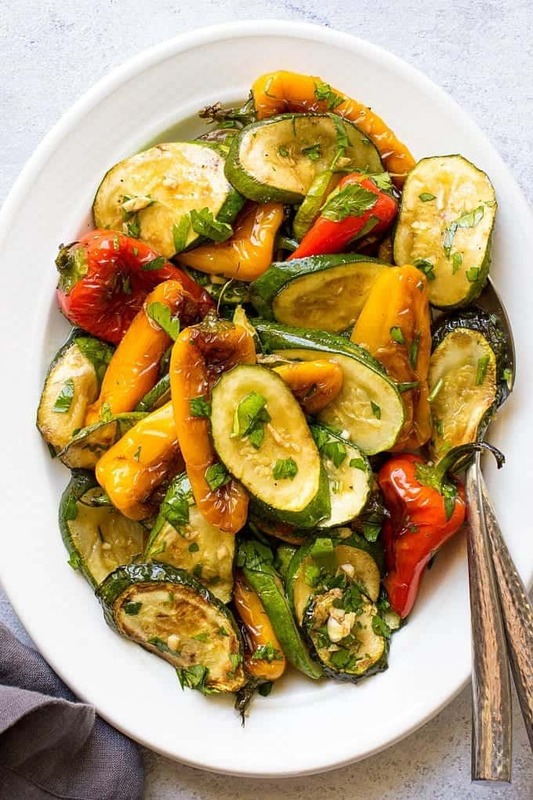 They are really delicious and come with a variety of vegetarian and non vegetarian toppings. That’s good to know Savita! I’m curious what kind of cheese do you add there? I’ve never heard of these but what a cool recipe! I love how the bread is made into a boat and stuffed with ingredients. Super inventive! These are absolutely gorgeous!! I love feta in my omelettes – this looks like another fun way to enjoy feta and eggs! This breakfast would totally make my weekend! So pinning this. Lovely photos too. Oh these look so good! I’ve only tried making khachapuri once and it was a plain flat one with some cheese within the dough. I looove these egg boat ones, a meal in themselves and so pretty! I have never heard of this until and I feel like my life has been incomplete without it! It looks so delicious, I’ll have to try this out on my family! Thank you Karen! These are really good! This is just beautiful — I could definitely see myself eating one (or two) for breakfast — or with a salad for lunch or dinner! Yum! Thanks Lisa! You would love Khachapuri, they are delicious! Wow! I’ve never heard of khachapuri but as a vegetarian, I think I’d love this! Thanks for sharing! Wow! These are amazing! That egg…swoon….